Google is continuously coming out with new technologies that make communication and organization easier and more convenient. Being organized and having a plan is vital to productivity in the workplace and when traveling, too. Enter Google Trips. alley and something I needed to try. I downloaded the app on my iPhone and it prompted me to sign in to my Gmail account. The next thing I know, a reservation popped up in my Google Trips app for an upcoming trip that I had planned. Google developed the new app to work with Gmail, taking any reservations from your inbox and putting them into your trip-planning app, pretty convenient and so easy to setup! After downloading the app, I was playing around with the different tiles and instantly noticed what a great business opportunity was available for hoteliers and business establishments in towns big and small. The app is set up to plan activities for the area that you are visiting, taking any information from Google and incorporating it into your stay. For businesses that don’t understand the need to promote themselves through Google services like Google My Business this app is a great reason to get listed! Don’t have a Google My Business account? Check out our earlier blog, Independent Hotel and Resort Google Guide, on how and why you will want to set one up! 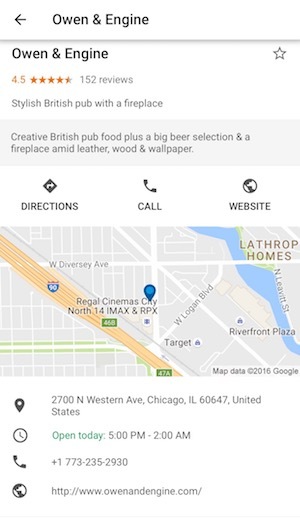 Just by being on Google, the app creates endless exposure for small and large businesses, here is an example. ation with a brief description of what you can expect for the environment and for the food. I chose a local restaurant that I hadn’t heard of before to support local businesses instead of chains. While I waited for my meal, I picked out a café for coffee that next morning and I planned a few other restaurants that I wanted to visit before going home. The app allows you to “star” or save places that you enjoyed, or that you know you want to visit while on your trip. I added the café and a few restaurants to my saved places and then browsed around in the things to do tile. In a matter of minutes, Google Trips provided me with tons of different local restaurants and café options. This was just one tile, the app allows you to look at local activities, shopping centers, small family owned and operated stores, you name it. Google Trips is just one benefit of promoting businesses on Google My Business. It will allow businesses to gain exposure and to increase traffic and business by bringing out of town guests to your establishment.